Last month Intel and Fossil announced an unnamed watch that caused me to come out to the public about my watch obsession. They didn’t give us much in the way of details, there were no specs, no name and not much other than the fact that it was Intel powered. Several days ago our friends over at Phandroid came across a trademark filing at the US Patent Office for the trademark “Fossil Q”. 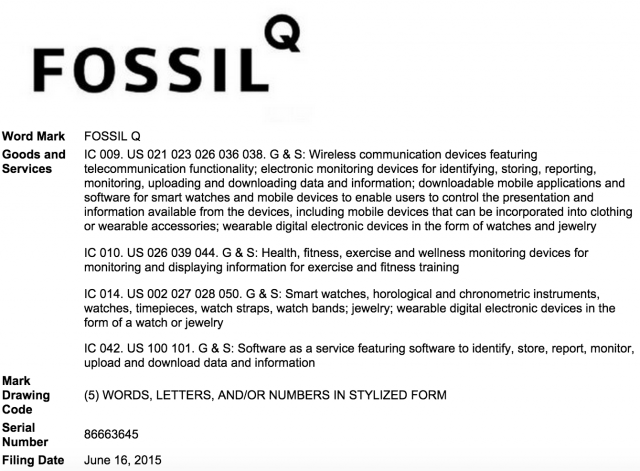 The trademark filing doesn’t specifically state that the watch that was shown is the Fossil Q but it does indicate that it is for a smart watch, with wireless communication functionality, health and fitness monitoring and a few other items. So even though it is likely that the filing is for the watch itself it could very well be for a product line of wearables or it could be for a whole other device. Only time will tell! Truly wireless earbuds! Which are best!? userrs would certainly benefit from a lot of the information you present here. Please leet me know if this ok with you. Many thanks! We would be happy to let you link back to our articles and would appreciate you doing so!